What better way to launch The Elegant Thrifter than a jaunt over to the hip Dumbo section of Brooklyn to the Brooklyn Flea's popup market. Thanks to the massive building that has dropped skyscrapers where some of the nation's most revered flea markets used to take place, Manhattan flea market fanatics now head over to Brooklyn for their thrift shopping fixes. One of my favorite finds today was an innovative company call Chairloom, which is dedicated to repurposing old furniture with fresh fabric and a little TLC. Now there are decorating purists who might say its absolutely necessary to use fabrics as similar as possible to the original piece. But I don't always buy that, since often old furniture needs a new twist to make it fit into today's decors. 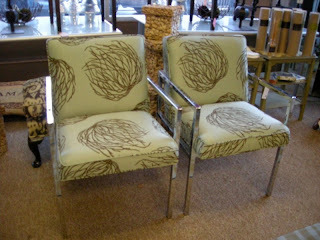 I love the earthy graphic swirls printed on the green fabric that covers the seats of this chrome set, and this curvy, armless Queen Anne chair with its contemporary graphic green motifs couldn't have had a better facelift for today. 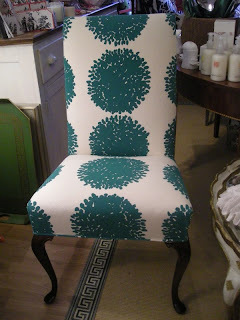 Furniture once destined for the garbage heap now has a new life, and maybe even a whole new image, thanks to Chairloom. 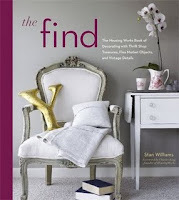 In May 2009, Clarkson Potter will publish my book, The Find, The Housing Works Book of Decorating with Thrift Shop Treasures, Flea Market Objects, and Vintage Details. Pre order now at Amazon, Barnes & Noble and Borders.